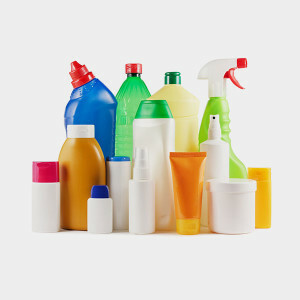 Cleaning product containers are usually made from plastic #1 or plastic #2, and can be easily recycled with plastic containers. If you’re unsure if it’s #1 or #2, check the label on the container. Most household cleaners do not need to be disposed of as household hazardous waste. Yet, containers must be completely empty before disposal. Follow the instructions on the label. It’s okay to flush small amounts of cleaning product down the drain with lots of water, but only if the cleaning product is a liquid, powder or gel. Find out to how to do dispose of these leftovers. Generally, it’s not necessary to remove the labels on cleaning product containers before recycling them. Recycle all brands of air care products and packaging through TerraCycle’s Febreze Air Care Recycling Program. Accepted materials include air freshener cartridges and plugs, packaging and flexible film packaging, and trigger heads. Plastic bottles and aerosol cans are not accepted through this program. Consider switching to more eco-friendly cleaners. Chemical cleaners can expose your household to a variety of harmful chemicals. They can also introduce more chemicals into the environment when they are washed down the drain. Check out the EWG’s Guide to Healthy Cleaning. Or cut down on container waste and follow these easy recipes from Real Simple to make your own natural cleaners. One of the easiest ways to cut down on trash (and to save money) is to buy cleaning products in bulk and refill the containers you have at home.